"AM Radio" redirects here. For the song by Everclear, see AM Radio (song). For the American musical group, see AM Radio (band). AM broadcasting is a radio broadcasting technology, which employs amplitude modulation (AM) transmissions. It was the first method developed for making audio radio transmissions, and is still used worldwide, primarily for medium wave (also known as "AM band") transmissions, but also on the longwave and shortwave radio bands. The earliest experimental AM transmissions began in the early 1900s. However, widespread AM broadcasting was not established until the 1920s, following the development of vacuum tube receivers and transmitters. AM radio remained the dominant method of broadcasting for the next 30 years, a period called the "Golden Age of Radio", until television broadcasting became widespread in the 1950s and received most of the programming previously carried by radio. Subsequently, AM radio's audiences have also greatly shrunk due to competition from FM (frequency modulation) radio, Digital Audio Broadcasting (DAB), satellite radio, HD (digital) radio and Internet streaming. AM transmissions are much more susceptible than FM or digital signals are to interference, and often have lower audio fidelity. Thus, AM broadcasters tend to specialise in spoken-word formats, such as talk radio, all news and sports, leaving the broadcasting of music mainly to FM and digital stations. AM and FM modulated signals for radio. AM (Amplitude Modulation) and FM (Frequency Modulation) are types of modulation (coding). The electrical signal from program material, usually coming from a studio, is mixed with a carrier wave of a specific frequency, then broadcast. In the case of AM, this mixing (modulation) is done by altering the amplitude (strength) of the carrier wave, proportional to the original signal. In contrast, in the case of FM, it is the carrier wave's frequency that is varied. A radio receiver contains a demodulator that extracts the original program material from the broadcast wave. For a broader coverage of this topic, see History of radio and History of broadcasting. 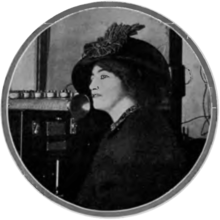 One of the earliest radio broadcasts, French soprano Mariette Mazarin singing into Lee de Forest's arc transmitter in New York City on February 24, 1910. The idea of broadcasting — the unrestricted transmission of signals to a widespread audience — dates back to the founding period of radio development, even though the earliest radio transmissions, originally known as "Hertzian radiation" and "wireless telegraphy", used spark-gap transmitters that could only transmit the dots-and-dashes of Morse code. In October 1898 a London publication, The Electrician, noted that "there are rare cases where, as Dr. [Oliver] Lodge once expressed it, it might be advantageous to 'shout' the message, spreading it broadcast to receivers in all directions". However, it was recognized that this would involve significant financial issues, as that same year The Electrician also commented "did not Prof. Lodge forget that no one wants to pay for shouting to the world on a system by which it would be impossible to prevent non-subscribers from benefiting gratuitously?" On January 1, 1902, Nathan Stubblefield gave a short-range "wireless telephone" demonstration, that included simultaneously broadcasting speech and music to seven locations throughout Murray, Kentucky. However, this was transmitted using induction rather than radio signals, and although Stubblefield predicted that his system would be perfected so that "it will be possible to communicate with hundreds of homes at the same time", and "a single message can be sent from a central station to all parts of the United States", he was unable to overcome the inherent distance limitations of this technology. The earliest public radiotelegraph broadcasts were provided as government services, beginning with daily time signals inaugurated on January 1, 1905, by a number of U.S. Navy stations. In Europe, signals transmitted from a station located on the Eiffel tower were received throughout much of Europe. In both the United States and France this led to a small market of receiver lines designed geared for jewelers who needed accurate time to set their clocks, including the Ondophone in France, and the De Forest RS-100 Jewelers Time Receiver in the United States The ability to pick up time signal broadcasts, in addition to Morse code weather reports and news summaries, also attracted the interest of amateur radio enthusiasts. It was immediately recognized that, much like the telegraph had preceded the invention of the telephone, the ability to make audio radio transmissions would be a significant technical advance. Despite this knowledge, it still took two decades to perfect the technology needed to make quality audio transmissions. In addition, the telephone had rarely been used for distributing entertainment, outside of a few "telephone newspaper" systems, most of which were established in Europe. With this in mind, most early radiotelephone development envisioned that the device would be more profitably developed as a "wireless telephone" for personal communication, or for providing links where regular telephone lines could not be run, rather than for the uncertain finances of broadcasting. 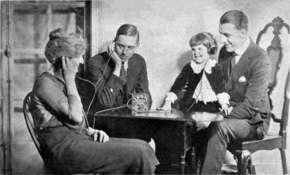 A family listening to an early broadcast using a crystal radio receiver in 1922. Crystal sets, used before the advent of vacuum tube radios in the 1920s, could not drive loudspeakers, so the family had to listen on earphones. The person generally credited as the primary early developer of AM technology is Canadian-born inventor Reginald Fessenden. The original spark-gap radio transmitters were impractical for transmitting audio, since they produced discontinuous pulses known as "damped waves". Fessenden realized that what was needed was a new type of radio transmitter that produced steady "undamped" (better known as "continuous wave") signals, which could then be "modulated" to reflect the sounds being transmitted. Fessenden's basic approach was disclosed in U.S. Patent 706,737, which he applied for on May 29, 1901, and was issued the next year. It called for the use of a high-speed alternator (referred to as "an alternating-current dynamo") that generated "pure sine waves" and produced "a continuous train of radiant waves of substantially uniform strength", or, in modern terminology, a continuous-wave (CW) transmitter. Fessenden began his research on audio transmissions while doing developmental work for the United States Weather Service on Cobb Island, Maryland. Because he did not yet have a continuous-wave transmitter, initially he worked with an experimental "high-frequency spark" transmitter, taking advantage of the fact that the higher the spark rate, the closer a spark-gap transmission comes to producing continuous waves. He later reported that, in the fall of 1900, he successfully transmitted speech over a distance of about 1.6 kilometers (one mile), which appears to have been the first successful audio transmission using radio signals. However, at this time the sound was far too distorted to be commercially practical. For a time he continued working with more sophisticated high-frequency spark transmitters, including versions that used compressed air, which began to take on some of the characteristics of arc-transmitters. Fessenden attempted to sell this form of radiotelephone for point-to-point communication, but was unsuccessful. Fessenden's work with high-frequency spark transmissions was only a temporary measure. His ultimate plan for creating an audio-capable transmitter was to redesign an electrical alternator, which normally produced alternating current of at most a few hundred (Hz), to increase its rotational speed and so generate currents of tens-of-thousands Hz, thus producing a steady continuous-wave transmission when connected to an aerial. The next step, adopted from standard wire-telephone practice, was to insert a simple carbon microphone into the transmission line, to modulate the carrier wave signal to produce AM audio transmissions. However, it would take many years of expensive development before even a prototype alternator-transmitter would be ready, and a few years beyond that for high-power versions to become available. Fessenden worked with General Electric's (GE) Ernst F. W. Alexanderson, who in August 1906 delivered an improved model which operated at a transmitting frequency of approximately 50 kHz, although at low power. The alternator-transmitter achieved the goal of transmitting quality audio signals, but the lack of any way to amplify the signals meant they were somewhat weak. On December 21, 1906, Fessenden made an extensive demonstration of the new alternator-transmitter at Brant Rock, Massachusetts, showing its utility for point-to-point wireless telephony, including interconnecting his stations to the wire telephone network. As part of the demonstration, speech was transmitted 18 kilometers (11 miles) to a listening site at Plymouth, Massachusetts. An American Telephone Journal account of the December 21 alternator-transmitter demonstration included the statement that "It is admirably adapted to the transmission of news, music, etc. as, owing to the fact that no wires are needed, simultaneous transmission to many subscribers can be effected as easily as to a few", echoing the words of a handout distributed to the demonstration witnesses, which stated "[Radio] Telephony is admirably adapted for transmitting news, stock quotations, music, race reports, etc. simultaneously over a city, on account of the fact that no wires are needed and a single apparatus can distribute to ten thousand subscribers as easily as to a few. It is proposed to erect stations for this purpose in the large cities here and abroad." However, other than two holiday transmissions reportedly made shortly after these demonstrations, Fessenden does not appear to have conducted any radio broadcasts for the general public, or to have even given additional thought about the potential of a regular broadcast service, and in a 1908 article providing a comprehensive review of the potential uses for his radiotelephone invention, he made no references to broadcasting. Because there was no way to amplify electrical currents at this time, modulation was usually accomplished by a carbon microphone inserted directly in the antenna wire. This meant that the full transmitter power flowed through the microphone, and even using water cooling, the power handling ability of the microphones severely limited the power of the transmissions. Ultimately only a small number of large and powerful Alexanderson alternators would be developed. However, they would be almost exclusively used for long-range radiotelegraph communication, and occasionally for radiotelephone experimentation, but were never used for general broadcasting. Almost all of the continuous wave AM transmissions made prior to 1915 were made by versions of the arc converter transmitter, which had been initially developed by Valdemar Poulsen in 1903. Arc transmitters worked by producing a pulsating electrical arc in an enclosed hydrogen atmosphere. They were much more compact than alternator transmitters, and could operate on somewhat higher transmitting frequencies. However, they suffered from some of the same deficiencies. The lack of any means to amplify electrical currents meant that, like the alternator transmitters, modulation was usually accomplished by a microphone inserted directly in the antenna wire, which again resulted in overheating issues, even with the use of water-cooled microphones. Thus, transmitter powers tended to be limited. The arc was also somewhat unstable, which reduced audio quality. Experimenters who used arc transmitters for their radiotelephone research included Ernst Ruhmer, Quirino Majorana, Charles "Doc" Herrold, and Lee de Forest. Advances in vacuum tube technology (called "valves" in British usage), especially after around 1915, revolutionized radio technology. Vacuum tube devices could be used to amplify electrical currents, which overcame the overheating issues of needing to insert microphones directly in the transmission antenna circuit. Vacuum tube transmitters also provided high-quality AM signals, and could operate on higher transmitting frequencies than alternator and arc transmitters. 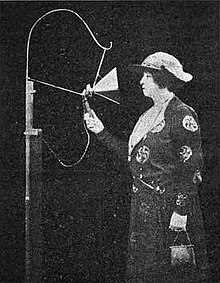 Non-governmental radio transmissions were prohibited in many countries during World War I, but AM radiotelephony technology advanced greatly due to wartime research, and after the war the availability of tubes sparked a great increase in the number of amateur radio stations experimenting with AM transmission of news or music. Vacuum tubes remained the central technology of radio for 40 years, until transistors began to dominate in the 1960s, and are still used in the highest power broadcast transmitters. Unlike telegraph and telephone systems, which used completely different types of equipment, most radio receivers were equally suitable for both radiotelegraph and radiotelephone reception. In 1903 and 1904 the electrolytic detector and thermionic diode (Fleming valve) were invented by Reginald Fessenden and John Ambrose Fleming, respectively. Most important, in 1904–1906 the crystal detector, the simplest and cheapest AM detector, was developed by G. W. Pickard. Homemade crystal radios spread rapidly during the next 15 years, providing ready audiences for the first radio broadcasts. One limitation of crystals sets was the lack of amplifying the signals, so listeners had to use earphones, and it required the development of vacuum-tube receivers before loudspeakers could be used. The dynamic cone loudspeaker, invented in 1924, greatly improved audio frequency response over the previous horn speakers, allowing music to be reproduced with good fidelity. 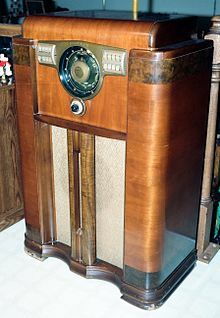 AM radio offered the highest sound quality available in a home audio device prior to the introduction of the high-fidelity, long-playing record in the late 1940s. Listening habits changed in the 1960s due to the introduction of the revolutionary transistor radio, which made possible by the invention of the transistor in 1946. Their compact size — small enough to fit in a shirt pocket — and lower power requirements, compared to vacuum tubes, meant that for the first time radio receivers were readily portable. The transistor radio became the most widely used communication device in history, with billions manufactured by the 1970s. Radio became a ubiquitous "companion medium" which people could take with them anywhere they went. 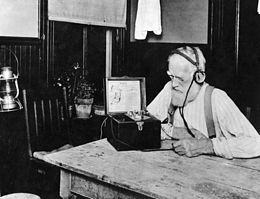 Christmas Eve 1906 Until the early 1930s, it was generally accepted that Lee de Forest's series of demonstration broadcasts begun in 1907 were the first transmissions of music and entertainment by radio. However, in 1932 an article prepared by Samuel M. Kintner, a former associate of Reginald Fessenden, asserted that Fessenden had actually conducted two earlier broadcasts. This claim was based solely on information included in a January 29, 1932, letter that Fessenden had sent to Kintner. (Fessenden subsequently died five months before Kintner's article appeared). In his letter, Fessenden reported that, on the evening of December 24, 1906 (Christmas Eve), he had made the first of two broadcasts of music and entertainment to a general audience, using the alternator-transmitter at Brant Rock, Massachusetts. Fessenden remembered producing a short program that included playing a phonograph record, followed by his playing the violin and singing, and closing with a bible reading. He also stated that a second short program was broadcast on December 31 (New Year's Eve). The intended audience for both transmissions was primarily shipboard radio operators along the Atlantic seaboard. Fessenden claimed these two programs had been widely publicized in advance, with the Christmas Eve broadcast heard "as far down" as Norfolk, Virginia, while the New Year Eve's broadcast had been received in the West Indies. However, extensive efforts to verify Fessenden's claim during both the 50th and 100th anniversaries of the claimed broadcasts, which included reviewing ships' radio log accounts and other contemporary sources, have so far failed to confirm that these reported holiday broadcasts actually took place. 1907-1912 Lee de Forest conducted a series of test broadcasts beginning in 1907, and was widely quoted promoting the potential of organized radio broadcasting. Using a series of arc transmitters, he made his first entertainment broadcast on February 1907, transmitting electronic telharmonium music from his "Highbridge" laboratory station in New York City. This was followed by tests that included, in the fall, Eugenia Farrar singing "I Love You Truly". Additional promotional events in New York included live performances by famous Metropolitan Opera stars such as Mariette Mazarin, Geraldine Farrar, and Enrico Caruso. He also broadcast phonograph music from the Eiffel Tower in Paris. His company equipped the U.S. Navy's Great White Fleet with experimental arc radiotelephones for their 1908 around-the-world cruise, and the operators broadcast phonograph music as the ships entered ports like San Francisco and Honolulu. June 1910 In a June 23, 1910, notarized letter that was published in a catalog produced by the Electro Importing Company of New York, Charles "Doc" Herrold reported that, using one of that company's spark coils to create a "high frequency spark" transmitter, he had successfully broadcast "wireless phone concerts to local amateur wireless men". Herrold lived in San Jose, California. 1913 Robert Goldschmidt began experimental radiotelephone transmissions from the Laeken station, near Brussels, Belgium, and by March 13, 1914 the tests had been heard as far away as the Eiffel Tower in Paris. January 15, 1920 Broadcasting in the UK began with impromptu news and phonograph music over 2MT, the 15 kW experimental tube transmitter at Marconi's factory in Chelmsford, Essex, at a frequency of 120 kHz. On June 15, 1920, the Daily Mail newspaper sponsored the first scheduled British radio concert, by the famed Australian opera diva Nellie Melba. This transmission was heard throughout much of Europe, including in Berlin, Paris, The Hague, Madrid, Spain, and Sweden. Chelmsford continued broadcasting concerts with noted performers. A few months later, in spite of burgeoning popularity, the government ended the broadcasts, due to complaints that the station's longwave signal was interfering with more important communication, in particular military aircraft radio. In July 1912, Charles "Doc" Herrold began weekly broadcasts in San Jose, California, using an arc transmitter. Broadcasting in Germany began 1922 as a Post Office monopoly on a subscription basis, using sealed receivers which could only receive one station. July 21, 1912 The first person to transmit entertainment broadcasts on a regular schedule appears to have been Charles "Doc" Herrold, who inaugurated weekly programs, using an arc transmitter, from his Wireless School station in San Jose, California. The broadcasts continued until the station was shut down due to the entrance of the United States into World War I in April 1917. March 28, 1914 The Laeken station in Belgium, under the oversight of Robert Goldschmidt, inaugurated a weekly series of concerts, transmitted at 5:00 p.m. on Saturdays. These continued for about four months until July, and were ended by the start of World War I. In August 1914 the Laeken facilities were destroyed, to keep them from falling into the hands of invading German troops. November 1916 De Forest perfected "Oscillion" power vacuum tubes, capable of use in radio transmitters, and inaugurated daily broadcasts of entertainment and news from his New York "Highbridge" station, 2XG. This station also suspended operations in April 1917 due to the prohibition of civilian radio transmissions following the United States' entry into World War I. Its most publicized program was the broadcasting of election results for the Hughes-Wilson presidential election on November 7, 1916, with updates provided by wire from the New York American offices. An estimated 7,000 radio listeners as far as 200 miles (320 kilometers) from New York heard election returns interspersed with patriotic music. April 17, 1919 Shortly after the end of World War I, F. S. McCullough at the Glenn L. Martin aviation plant in Cleveland, Ohio, began a weekly series of phonograph concerts. However, the broadcasts were soon suspended, due to interference complaints by the U.S. Navy. Late 1919 De Forest's New York station, 2XG, returned to the airwaves in late 1919 after having to suspend operations during World War I. The station continued to operate until early 1920, when it was shut down because the transmitter had been moved to a new location without permission. May 20, 1920 Experimental Canadian Marconi station XWA (later CFCF, deleted in 2010 as CINW) in Montreal began regular broadcasts, and claims status as the first commercial broadcaster in the world. June 1920 De Forest transferred 2XG's former transmitter to San Francisco, California, where it was relicensed as 6XC, the "California Theater station". By June 1920 the station began transmitting daily concerts. De Forest later stated that this was the "first radio-telephone station devoted solely" to broadcasting to the public. August 20, 1920 On this date the Detroit News began daily transmissions over station 8MK (later WWJ), located in the newspaper's headquarters building. The newspaper began extensively publicizing station operations beginning on August 31, 1920, with a special program featuring primary election returns. Station management later claimed the title of being where "commercial radio broadcasting began". November 2, 1920 Beginning on October 17, 1919, Westinghouse engineer Frank Conrad began broadcasting recorded and live music on a semi-regular schedule from his home station, 8XK in Wilkinsburg, Pennsylvania. This inspired his employer to begin its own ambitious service at the company's headquarters in East Pittsburgh, Pennsylvania. Operations began, initially with the call sign 8ZZ, with an election night program featuring election returns on November 2, 1920. As KDKA, the station adopted a daily schedule beginning on December 21, 1920. This station is another contender for the title of "first commercial station". 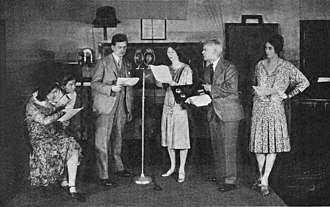 A live radio play being broadcast at NBC studios in New York. Most 1920s through 1940s network programs were broadcast live. Because most longwave radio frequencies were used for international radiotelegraph communication, a majority of early broadcasting stations operated on mediumwave frequencies, whose limited range generally restricted them to local audiences. One method for overcoming this limitation, as well as a method for sharing program costs, was to create radio networks, linking stations together with telephone lines to provide a nationwide audience. In the U.S., the American Telephone and Telegraph Company (AT&T) was the first organization to create a radio network, and also to promote commercial advertising, which it called "toll" broadcasting. Its flagship station, WEAF (now WFAN) in New York City, sold blocks of airtime to commercial sponsors that developed entertainment shows containing commercial messages. AT&T held a monopoly on quality telephone lines, and by 1924 had linked 12 stations in Eastern cities into a "chain". The Radio Corporation of America (RCA), General Electric and Westinghouse organized a competing network around its own flagship station, RCA's WJZ (now WABC) in New York City, but were hampered by AT&T's refusal to lease connecting lines or allow them to sell airtime. In 1926 AT&T sold its radio operations to RCA, which used them to form the nucleus of the new NBC network. By the 1930s, most of the major radio stations in the country were affiliated with networks owned by two companies, NBC and CBS. In 1934, a third national network, the Mutual Radio Network was formed as a cooperative owned by its stations. 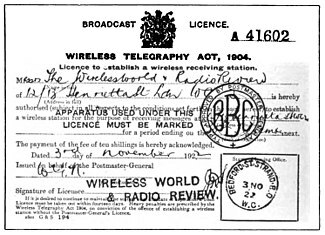 A BBC receiver licence from 1923. The British government required listeners to purchase yearly licences, which financed the stations. A second country which quickly adopted network programming was the United Kingdom, and its national network quickly became a prototype for a state-managed monopoly of broadcasting. A rising interest in radio broadcasting by the British public pressured the government to reintroduce the service, following its suspension in 1920. However, the government also wanted to avoid what it termed the "chaotic" U.S. experience of allowing large numbers of stations to operate with few restrictions. There were also concerns about broadcasting becoming dominated by the Marconi company. Arrangements were made for six large radio manufacturers to form a consortium, the British Broadcasting Company (BBC), established on 18 October 1922, which was given a monopoly on broadcasting. This enterprise was supported by a tax on radio sets sales, plus an annual license fee on receivers, collected by the Post Office. Initially the eight stations were allowed regional autonomy. In 1927, the original broadcasting organization was replaced by a government chartered British Broadcasting Corporation. an independent nonprofit supported solely by a 10 shilling receiver license fee. A mixture of populist and high brow programmes were carried by the National and Regional networks. When broadcasting began in 1920, music was played on air without regard to its copyright status. 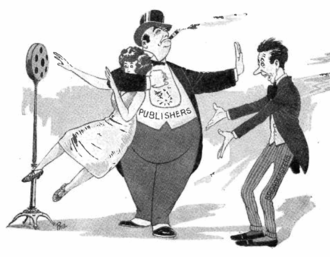 Music publishers challenged this practice as being copyright infringement, which for a time kept many popular tunes off the air, and this 1925 editorial cartoon shows a rich publisher muzzling two radio performers. The radio industry eventually agreed to make royalty payments. The period from the 1920s to the 1940s is often called the "Golden Age of Radio". During this period AM radio was the main source of home entertainment, until it was replaced by television. For the first time entertainment was provided from outside the home, replacing traditional forms of entertainment such as oral storytelling and music from family members. New forms were created, including radio plays, mystery serials, soap operas, quiz shows, variety hours, situation comedies and children's shows. Radio news, including remote reporting, allowed listeners to be vicariously present at notable events. Radio greatly eased the isolation of rural life. Political officials could now speak directly to millions of citizens. One of the first to take advantage of this was American president Franklin Roosevelt, who became famous for his fireside chats during the Great Depression. However, broadcasting also provided the means to use propaganda as a powerful government tool, and contributed to the rise of fascist and communist ideologies. In the 1940s two new broadcast media, FM radio and television, began to provide extensive competition with the established broadcasting services. The AM radio industry suffered a serious loss of audience and advertising revenue, and coped by developing new strategies. Network broadcasting gave way to format broadcasting: instead of broadcasting the same programs all over the country, stations individually adopted specialized formats which appealed to different audiences, such as regional and local news, sports, "talk" programs, and programs targeted at minorities. Instead of live music, most stations began playing less expensive recorded music. However, the ongoing development of alternative, and superior, transmission systems, including Digital Audio Broadcasting (DAB), satellite radio, and HD (digital) radio, continued the decline of the popularity of the traditional broadcast technologies. These new options, including the introduction of Internet streaming, particularly resulted in the reduction of shortwave transmissions, as international broadcasters found ways to more easily reach their audiences. In the late 1970s, spurred by the exodus of musical programming to FM stations, the AM radio industry in the United States developed technology for broadcasting in stereo. (FM broadcasting in the United States adopted a common stereo standard in 1961.) The effort was challenging due to the need to limit the transmissions to a 20 kHz bandwidth, while also making the transmissions backward compatible with existing non-stereo receivers. In 1975 the U.S. Federal Communications Commission (FCC) requested proposals for AM stereo standards, and four competing standards were submitted: Harris Corporation's V-CPM (Variable angle Compatible Phase Multiplex), Magnavox's PMX, Motorola's C-QUAM (Compatible Quadrature Amplitude Modulation), and Kahn-Hazeltine independent sideband system." All except the Kahn-Hazeltine system used variations on the same idea: the mono (Left + Right) signal was transmitted in the amplitude modulation as before, while the stereo (Left — Right) information was transmitted by phase modulation. In 1980 the FCC selected the Magnavox PMX system as the U.S. standard, but this choice was immediately contested by the losing applicants in the courts. In 1982, the FCC reversed its decision and decided not to enforce a common standard, but instead allow multiple systems to be installed, to "let the marketplace decide". Other nations adopted AM stereo, most commonly choosing Motorola's C-QUAM. The choice of a single standard, rather than allowing competing standards as the U.S., resulted in greater acceptance of AM stereo in these markets. In 1993, the FCC again updated its policy, now making the C-QUAM system the U.S. standard, however, it has been subsequently installed by very few stations. There was a limited adoption of AM stereo worldwide, and interest declined after 1990. With the continued migration of AM stations away from music to news, sports, and talk formats, receiver manufacturers saw little reason to adopt the more expensive stereo tuners, and thus radio stations have little incentive to upgrade to stereo transmission. AM radio technology is simpler than later transmission systems. An AM receiver detects amplitude variations in the radio waves at a particular frequency, then amplifies changes in the signal voltage to operate a loudspeaker or earphone. However, the simplicity of AM transmission also makes it vulnerable to "static" (radio noise, radio frequency interference) created by both natural atmospheric electrical activity such as lightning, and electrical and electronic equipment, including fluorescent lights, motors and vehicle ignition systems. In large urban centres, AM radio signals can be severely disrupted by metal structures and tall buildings. As a result, AM radio tends to do best in areas where FM frequencies are in short supply, or in thinly populated or mountainous areas where FM coverage is poor. Great care must be taken to avoid mutual interference between stations operating on the same frequency. In general, an AM transmission needs to be about 20 times stronger than an interfering signal to avoid a reduction in quality, in contrast to FM signals, where the "capture effect" means that the dominant signal needs to only be about twice as strong as the interfering one. To allow room for more stations on the mediumwave broadcast band in the United States, in June 1989 the FCC adopted a National Radio Systems Committee (NRSC) standard that limited maximum transmitted audio bandwidth to 10.2 kHz, limiting occupied bandwidth to 20.4 kHz. The former audio limitation was 15 kHz resulting in bandwidth of 30 kHz. Another common limitation on AM fidelity is the result of receiver design, although some efforts have been made to improve this, notably through the AMAX standards adopted in the United States. AM broadcasts are used on several frequency bands. The allocation of these bands is governed by the ITU's Radio Regulations and, on the national level, by each country's telecommunications administration (the FCC in the U.S., for example) subject to international agreements. The frequency ranges given here are those that are allocated to stations. Because of the bandwidth taken up by the sidebands, the range allocated for the band as a whole is usually about 5 kHz wider on either side. Longwave (also known as Low frequency (LF)) (148.5–283.5 kHz) Broadcasting stations in this band are assigned transmitting frequencies in the range 153–279 kHz, and generally maintain 9 kHz spacing. Longwave assignments for broadcasting only exist in ITU Region 1 (Europe, Africa, and northern and central Asia), and is not allocated elsewhere. Individual stations have coverage measured in the hundreds of kilometers, however there are only a very limited number of available broadcasting slots. Most of the earliest broadcasting experiments took place on longwave frequencies, however complaints about interference from existing services, particularly the military, led to most broadcasting moving to higher frequencies. Medium wave (also known as Medium frequency (MF)), which is by far the most commonly used AM broadcasting band. In ITU Regions 1 and 3, transmitting frequencies run from 531 to 1602 kHz, with 9 kHz spacing (526.5–1606.5 kHz), and in ITU Region 2 (the Americas), transmitting frequencies are 530 to 1700 kHz, using 10 kHz spacing (525–1705 kHz), including the ITU Extended AM broadcast band, authorized in Region 2, between 1605 and 1705 kHz, previously used for police radio. Shortwave (also known as High frequency (HF)) transmissions range from approximately 2.3 to 26.1 MHz, divided into 14 broadcast bands. Shortwave broadcasts generally use a narrow 5 kHz channel spacing. Shortwave is used by audio services intended to be heard at great distances from the transmitting station. The long range of shortwave broadcasts comes at the expense of lower audio fidelity. Most broadcast services use AM transmissions, although some use a modified version of AM such as Single-sideband modulation (SSB) or an AM-compatible version of SSB such as "SSB with carrier reinserted". Beginning in the mid-1930s, the United States evaluated options for the establishment of broadcasting stations using much higher transmitting frequencies. In October 1937, the FCC announced a second band of AM stations, consisting of 75 channels spanning from 41.02 to 43.98 MHz, which were informally called Apex. The 40 kHz spacing between adjacent frequencies was four times that of the 10 kHz spacing used on the standard AM broadcast band, which reduced adjacent-frequency interference, and provided more bandwidth for high-fidelity programming. However, this band was eliminated effective 1 January 1941, after the FCC determined that establishing a band of FM stations was preferable. Beginning in the mid-1930s, starting with "The Brown Network" at Brown University in Providence, Rhode Island, a very low power broadcasting method known as carrier current was developed, and mostly adopted on U.S. college campuses. In this approach AM broadcast signals are distributed over electric power lines, which radiate a signal receivable at a short distance from the lines. In Switzerland a system known as "wire broadcasting" (Telefonrundspruch in German) transmitted AM signals over telephone lines in the longwave band until 1998, when it was shut down. In the UK, Rediffusion was an early pioneer of AM radio cable distribution. Hybrid digital broadcast systems, which combine (mono analog) AM transmission with digital sidebands, have started to be used around the world. In the United States, iBiquity's proprietary HD Radio has been adopted and approved by the FCC for medium wave transmissions, while Digital Radio Mondiale is a more open effort often used on the shortwave bands, and can be used alongside many AM broadcasts. Both of these standards are capable of broadcasting audio of significantly greater fidelity than that of standard AM with current bandwidth limitations, and a theoretical frequency response of 0–16 kHz, in addition to stereo sound and text data. Some microbroadcasters, especially those in the United States operating under the FCC's Part 15 rules, and pirate radio operators on mediumwave and shortwave, achieve greater range than possible on the FM band. On mediumwave these stations often transmit on 1610 kHz to 1710 kHz. Hobbyists also use low-power AM (LPAM) transmitters to provide programming for vintage radio equipment in areas where AM programming is not widely available or does not carry programming the listener desires; in such cases the transmitter, which is designed to cover only the immediate property and perhaps nearby areas, is connected to a computer, an FM radio or an MP3 player. Microbroadcasting and pirate radio have generally been supplanted by streaming audio on the Internet, but some schools and hobbyists still use LPAM transmissions. Amplitude Modulation Signalling System, a digital system for adding low bitrate information to an AM broadcast signal. MW DXing, the hobby of receiving distant AM radio stations on the mediumwave band. ^ Nahin, Paul J. (2001). The Science of Radio: With Matlab and Electronics Workbench Demonstration, 2nd Ed. Springer Science & Business Media. pp. xxxix. ISBN 0387951504. ^ "Wireless Telegraphy", The Electrician (London), October 14, 1898, pages 814-815. ^ "Hertzian Telegraphy at the Physical Society, The Electrician (London), January 28, 1898, pages 452-453. ^ "Kentucky Inventor Solves Problem of Wireless Telephony", The Sunny South, March 8, 1902, page 6. ^ "Vest-Pocket Wireless Receiving Instrument", Electrical Review and Western Electrician, April 11, 1914, page 745. ^ "Radio Apparatus" (advertisement), Radio Amateur News, October 1919, page 200. ^ U.S. Patent 706,737, submitted May 29, 1901, and issued August 12, 1902, to Reginald Fessenden. 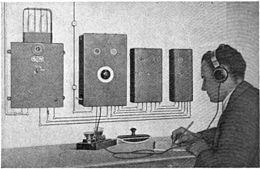 ^ "Experiments and Results in Wireless Telephony", by John Grant, The American Telephone Journal, January 26, 1907, pages 49-51. ^ The Continuous Wave by Hugh G. J. Aitken, 1985, page 61. ^ Aitken (1985), page 62. ^ "Fessenden, Reginald A. ''Inventing the Wireless Telephone and the Future''". Ewh.ieee.org. Retrieved 2017-07-22. ^ Aitken (1985), page 69. ^ a b "Experiments and Results in Wireless Telephony" by John Grant, The American Telephone Journal. Part I: January 26, 1907, pages 49-51; Part II: February 2, 1907, pages 68-70, 79-80. ^ "Wireless Telephony" by Reginald A. Fessenden, Transactions of the American Institute of Electrical Engineers, Vol. XXVII (1908), Part I, pages 606-608. ^ "Method of Producing Alternating Currents With a High Number of Vibrations" U.S. patent 789,449, filed June 10, 1903, and granted May 9, 1905, to Valdemar Poulsen. ^ "The Versatile Audion" by H. Winfield Secor, Electrical Experimenter, February 1920, pages 1000-1001, 1080-1083. ^ "Pittsburgh's Contributions to Radio" by S. M. Kintner, Proceedings of the Institute of Radio Engineers, December 1932, pages 1849-1862. ^ Fessenden: Builder of Tomorrows by Helen Fessenden, 1940, pages 153-154. ^ Father of Radio by Lee de Forest, 1950, page 225. ^ I Looked and I Listened by Ben Gross, 1954, page 48. ^ "Mysterious Voices Startled Him: Wizard Isbell Thought He Heard Angels Talking", Hawaiian Star, November 25, 1908, page 1. ^ Electro Importing Company catalog page, reproduced in Charles Herrold, Inventor of Radio Broadcasting by Gordon Greb and Mike Adams, 2003, page 6. ^ "De la T.S.F. au Congo-Belge et de l'école pratique de Laeken aux concerts radiophoniques" (Wireless in the Belgian Congo and from the Laeken Training School to Radio Concerts) by Bruno Brasseur, Cahiers d'Histoire de la Radiodiffusion, Number 118, October-December 2013. ^ "A Newspaper's Use of the Radio Phone", The Wireless Age, November 1920, page 10. ^ The History of Broadcasting in the United Kingdom: Vol. I: The Birth of Broadcasting by Asa Briggs, 1961, pages 49-50. ^ The Broadcasters by Red Barber, 1970, pages 11-12. ^ "Miscellaneous: Amendments to Regulations", Radio Service Bulletin, January 3, 1922, page 10. ^ "Radio Department: Broadcasting Stations", Winnipeg Evening Tribune, April 25, 1922, page 5. 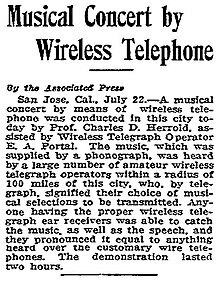 ^ "Will Give Concert by Wireless Telephone", San Jose Mercury Herald, July 21, 1912, page 27. ^ "Hear Tenor Through Wireless", Washington Evening Star, 29 March 1914, Part one, page 2. ^ "Wireless Transmission of News". Telephony. Chicago: Telephony Publishing Co. 71 (27): 32–33. December 10, 1916. Retrieved December 23, 2015. ^ "Hear Caruso Sing by Wireless Thursday! ", Cleveland Plain Dealer, April 17, 1919, page 1. ^ "Stop Wireless Concerts Here", Cleveland Plain Dealer, May 29, 1919, page 9. ^ "Communications Commentary: PCGG", Electronics & Wireless World, February 1986, page 26. ^ "Foot Ball Score—Via Wireless Telephone" by Morris Press, Radio Amateur News, December 1919, pages 295, 321. ^ "Wireless Concert Given for Ottawa", Montreal Gazette, May 21, 1920, page 4. ^ "Ninth California Theatre Concert", Pacific Coast Musical Review, May 29, 1920, page 9. ^ "Electrical Home Visitors to Hear Wireless Concert", San Francisco Chronicle, June 20, 1920, page 8. ^ "'Broadcasting' News by Radiotelephone" (letter from Lee de Forest), Electrical World, April 23, 1921, page 936. ^ "The News Radiophone To Give Vote Results", Detroit News, August 31, 1920, pages 1-2. ^ "The Radio Amateur: Wireless Telephone Here" by C. E. Urban, Pittsburgh Gazette Times, Sixth section, page 13. ^ "To Give Election Results by Radio", Cleveland Plain Dealer, October 28, 1920, page 10. ^ KDKA, The Wireless Age, August 1922, page 40. ^ "Announcing the National Broadcasting Company, Inc." (advertisement), Reading (Pennsylvania) Eagle, September 13, 1926, page 10. ^ Hilmes, Michele (2011). Network Nations: A Transnational History of British and American Broadcasting. Routledge. p. 6. ISBN 0415883857. ^ "Radio Fans to Pay Tribute to John Bull", Popular Radio, November 1922, page 222. ^ "A Concise History of British Radio, 1922-2002". google.com. ^ a b "A Concise History of British Radio, 1922-2002". google.com. ^ The Gas Pipe Networks by Louis M. Bloch, Jr, 1980. ^ "Sammlung alter Biennophone-Radios". Biennophone.ch. Retrieved 23 July 2017.